water pollution in and around capital Dhaka, especially the waters of the rivers Buriganga, Turag, Balu and Tongi canal have been threatening the supply of safe drinking water and public health of over 10 million city dwellers. 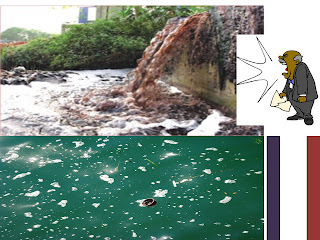 The main sources of water pollution in the capital are domestic sewage including human excreta, bathroom and kitchen wastewater,industrial wastewater including toxic chemicals, pesticides and fertilizers used in the agricultural fields around city. At present, colour of water of these four rivers, canals and ditches in and around the capital has become almost black with bad smells making it impossible for fish to survive as the organic wastes have been absorbing the dissolved oxygen from water. The industries are the major source of pollution of the Turag river while many others dump their wastes in the rivers Balu and Shitalakhya.